Annan bounced back from their disappointing performance against Edinburgh City with a solid 2 goal victory victory over Elgin City. The Annan team showed 4 changes with Aiden Smith, Rabin Omar and new loan signing Ryan Sinnamon from Rangers all being introduced to the starting line up. Annan limited Elgin to very few scoring opportunities in a game where the Black and Golds kept a clean sheet for the first time this season, leaving the host’s with a frustrating afternoon. It was a goal at the start of each half which put Annan on the road to victory. The first goal in the second minute was a well worked goal and started when Ryan Finnie played in David McKenna who’s first time pass across the park to Darren Ramsay created the space for him to hit a low well placed shot from 10 yards, beating keeper Marc Waters to give Annan the best possible start to the match. It was a start where Elgin tried hard to get back into the match but the Annan defence were solid with the back three of Watson Swinglehurst and Black being a last line of defence who for the first time this season looked comfortable to contain the threat of Elgin City. Chris McLeish came close in the 11th minute with a header which crept narrowly past the post. Annan opened up the Elgin defence in the 17th minute when a penetrating through ball put Aiden Smith in a good position but the striker failed to make the most of the opportunity. Thomas Reilly tested Blair Currie with a net-bound shot in the 21st minute but the Annan keeper denied the Elgin player with an important save pushing the effort for a corner kick. Elgin were pressing hard playing some nice controlled football but their final balls were posing little threat to the Annan defenders. As half time approached Annan carved open the Elgin defence with the pace of Aiden Smith instrumental in creating the opportunity after he latched in to a through ball but the cut back from the bye line was desperately cleared by the Elgin defence. Annan started the second half exactly in the same vein as they started the first half with a goal. 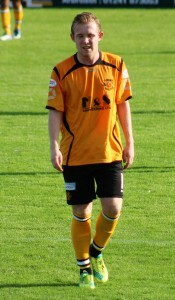 It was a good move which once again made the best of the pace of Aiden Smith when Darren Ramsay’s through ball put Smith one on one with keeper Marc Waters who upended the Annan striker as he was about to round him, the referee immediately pointed to the spot and David McKenna dispatched the spot kick into the net to give Annan a 2 goal cushion. It was not the start to the second half that Elgin were looking for but it was an important turning point in the match which put Annan firmly in the driving seat. Elgin brought on striker Craig Gunn in the 57th minute at the expense of Chris Dodd in an effort to give the home team more of a threat up front but unfortunately for the home team it did not work out that way. Elgin won a free kick 24 yards out in the 61st minute but Blair Currie pushed Daniel Moore’s well placed shot round the post for a corner corner kick. Annan looked comfortable containing any threat that Elgin could muster with the end product of their attacks being limited to efforts either over the bar or past the post. The most promising move that Annan had to contain resulted in a good move down the right in the 75th minute when Gunn set up Shane Sutherland but the final shot failed to test Currie. As the game reached the final stages the home defence were more and more being asked to defend the threat of Annan up front and in the 84th minute Aiden Smith’s well struck shot was palmed past the post by keeper Marc Waters who was at full stretch dealing with the effort. Smith was once again presented with another opportunity in the final minutes but his shot from a difficult angle slipped past the upright. It was a positive performance from the reshaped Annan team who for the first time this season managed to keep a clean sheet against an Elgin City side who unusually have dug out all their best results away from home this season. The results up to now have proven that there is not a lot between success and failure in this league with the threat of relegation proving to be a real catalyst for the teams. Annan face a blank week next Saturday due to the International week end with their next game being at Central Park, Cowdenbeath a ground where Annan commenced their SFL adventure. ELGIN CITY : Marc Waters, Mathew Cooper , Archie McPhee, Darryl McHardy, Mark Nicholson, Thomas Reilly , Jamie Reid( Daniel Moore ht) , Brian Cameron, Chris McLeish ( Kyle McLeod 70 min), Shane Sutherland, Chris Dodd ( Graig Gunn 57 min). Subs not used : Kieron Stewart, Errol Watson. ANNAN ATHLETIC: Blair Currie, Steven Black, Steven Swinglehurst, Ryan Sinnamon, Peter Watson, Barry Cuddihy, Rabin Omar, Ryan Finnie, David McKenna (Max Wright 87 min), Aiden Smith, Darren Ramsay ( William Robertson 78 min). Subs not used : Alex Mitchell, Adam Ashgar, Joan Guy Lucas, Aaron Bradbury, Raffi Krissian. ASSISTANTS Andrew McWilliam, Greg Soutar.